KEW ENGG. & MFG. PVT. LTD., is a leading manufacturer, exporter, and supplier of Ring Wrapping Machine. It is rotating ring machine for spiral wrapping with stretch film. Designed and built with features like simple to operate, heavy duty, Table-top model machine consists of a motorized variable speed Turn Table. 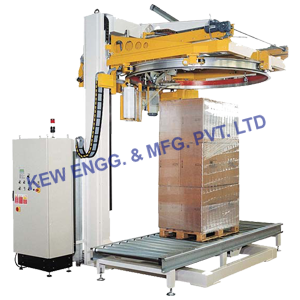 Ring Wrapping Machine is suitable for products wrapping & requires only 220V, 1-phase, 15 Amps & 0.75 kW power supply. The ‘powered pre-stretch’ unit stretches the LLDPE stretch cling film upto 300%, so as to cover the products consuming least quantity of stretch film.